What's everyone's favorite wilderness or roadless area? So, this is an opportunity to discuss them, share information, and learn something. Visiting these areas has been a big part of my life. At one time I hoped to visit every last one of them in Idaho, where I live. 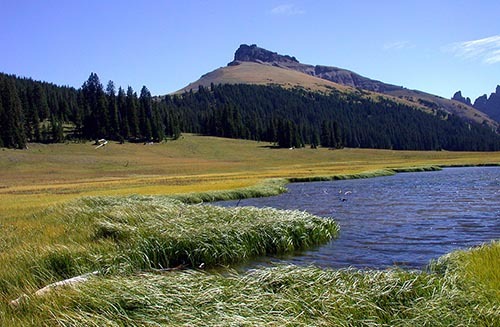 Because Idaho has more unprotected roadless area than any other state, my goal, happily proved infeasible.By the way, currently at his blog, Mike is featuring the Crazy Mountains (unprotected) roadless area in Montana. A great sign on the trail just as it starts to drop down to Dundee Meadows. 23 Responses to What's everyone's favorite wilderness or roadless area? hands down, the selway is my favorite wilderness that i’ve moved through. the true wildness of it, the immense size of it, ripping wildfires, huge snowfalls, cedars to subalpines, the ability to get lost in there….it is a remarkable place. the west elk wilderness in colorado and the frank church in idaho would be runners-up! miles and never see another soul – a tleast not during hunting season. Within the Shoshone National Forest’s Wind River District, I have a great fondness for the Dunoir, which, if any place deserves wilderness status, the Dunoir does. It is now a congressionally designated “Special Management Unit,” dating back to the creation of the Washakie Wilderness in 1974. Both the Forest Service and the logging industry were determined to log the Dunoir, not to mention put in developed campgrounds, back in the 1960s. Cconsiderable local opposition at the time from outfitters and dude ranchers, as well as from conservationists like Tom Bell, kept the logging trucks and developed campgrounds out of the Dunoir The Dunoir has languished in this SMU status now for 32 years. It is superb horse country, as are all the Absaroka Mountains. In the East Fork of the Dunoir, limestone outcroppings have emerged from the ovelying volcanic rock in the most amazing formations, including a deep limestone canyon through which the East Fork flows. Like Robert I have a great affection for the DuNoir, which should be part of the Washakie Wilderness and is adjacent and similar to it. 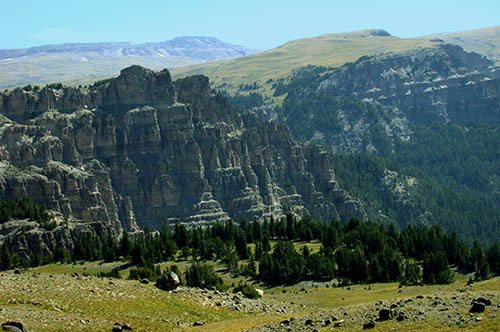 There is something about the Washakie, especially its southern portion which used to be the Stratied Primitive Area, that is mysterious — maybe those dark walls of volcanic conglomerate (breccia) the many waterfalls and the huge expanses of tundra on top. It’s one of the smaller wilderness areas in Colorado, but the Buffalo Peaks Wilderness area is truly beautiful and rarely visited. You can spend a whole weekend out there and see more elk than people. It doesn’t have the high peaks that the nearby Collegiates have but what it lacks in the hight mountain environment it makes up for in unparalled open mountain parks and abundant beaver ponds (perfect for fishing for brookies). Its a beautiful place to spend a quiet weekend in the mountains! To add a little more to what Ralph said about the part of the Washakie Wilderness that used to be known as the Stratified Primitive Area, part of the Wind River District, I frequently point out to people on pack trips, etc., that one can visit the Upper Wind River Country and literally see the entire geological history of the Rocky Mountains. One of the things that is unique about the old Stratified Primitive Area is the erosion of the ancient volcanic rock has created both deep canyons and high plateaus, and yet in the eroded areas, like the valleys in the Dunoir, you see the underlying sedimentary formations like the Limestone Canyon. And of course, we have the wonderful igneous basement rock of the Wind River Mountains and the very recent mudstones of the Badlands along the Wind River itself. So here you get the very old pre-Cambrian rocks, the sedimentary rocks of the paleozoic and mesozoic, and then volcanic rocks of the Cenozoic. In one place, which I shall not mention, remains of 18 different forests have been found, each overlain by a volcanic layer. I am convinced that this is one of the most unique places of the Rocky Mountains and deserves all the protection we can give it. Not to downgrade other roadless areas, of course! It’s a little hard to get legal access to the lower portions of the DuNoir. Most people take the scenic high elevation route over Bonneville Pass. While a grade school brat living in New Mexico, I hiked in the Pecos Wilderness in northern N.M. And also spent some great hours collecting pinon nuts in the Gila Wilderness in the state. Later, in my high school and college years in Idaho, I backpacked in what became the Frank Church-River of No Return Wilderness. So I would say the Frank is my favorite. But I just recently visited two wilderness areas in New Mexico, the Manzano Mountains south of Albuquerque and the Caballo Mts within Bosque del Apache NWR. I want desperately to return there with backpack strapped over my shoulders. All interesting choices. I really need to visit more of these wilderness/roadless areas. Most of what I have seen is in Montana, Minnesota, Colorado,Wyoming, New Mexico, Arizona , Michigan and parts of the Selway in Idaho. As Ralph said, there are so many to see that it would take a lifetime. All these areas are rare and fantastic, and even the small roadless areas can be really great. But there is something to be said of those wilderness areas (in combination with other or alone) that are a million acres or more. As a fly fisherman/hiker, I often find myself explaining to guys in fly shops and on the river the importance of these areas. Many don’t seem to see the importance, and of course groups like the BRC have gotten to some of them (“what about the access?”. etc). This fall I was able to spend some time at Pebble Creek campground in NE Yellowstone, and I was really amazed at that NE corner where Wyoming and Montana meet (the Beartooth area). That is some really wild country. Locally (SE Idaho) I really like the Pallisades area. It is relativley close and very easy to find solitude in the shadow of the Tetons. 3 hours East, I love the Wind RIver Range, and its multiude of Lake and cirques. In reponse to Ralph’s question about access to the Dunoir, aside from Bonneville Pass, which takes you down into Dundee Meadows, there is the Wolf Creek access point, at the end of FSR 513, the Long Creek Road, which leaves Hwy 26 somewhat across from and west of the entrance to the Triangle C Dude Ranch. 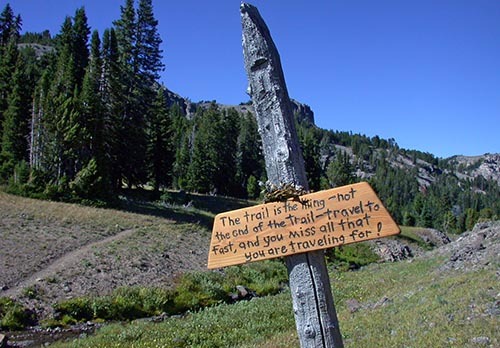 Trails will take you either toward Kissinger Lakes or to the lower reaches of the West Fork of the Dunoir. The :Pinnacles Trail, off the Brooks Lake Road, also takes you into Kissinger Lakes. This is one of the problem trails, as mountain bikers like to make a loop along the Pinnacles Trail to Kissinger Lakes, and then follow the trail north into Dundee Meadows, link into the Bonneville Pass Trail to ride up and over Bonneville Pass, and then ride down the Brooks Lake Road to the Pinnacles trailhead to complete the loop. Or the other way around. Because of the Dunoir’s SMU status, many of us believe that mountain bikes are not legal, conflicting with the wilderness character of the area. The Forest Service disagrees, unfortunately. We also have a problem with snowmobiles in the Dunoir, which the Forest Service also refuses to ban. We’ve had somewhat less trouble with mtn bikers since one our of Jackson ran into a grizzly on the Bonneville Pass Trail a couple of years ago. Perhaps my favorite means of access to the Dunoir breaks off the Burroughs Creek/Brent Creek road system off the Horse Creek Road; you catch the trail into the Dunoir off the southeast slopes of the Ramshorn, cross the south face of the Ramshorn at the heads of Five and Six Mile Creeks, and eventually drop into the immense Tie Hack Meadows through which the East Fork of the Dunoir flows. By coincidence, this is part of the migration route of the Dunoir segment of the Wiggins Fork Elk Herd, which summers across the Continental Divide on the Buffalo Plateau with part of the Jackson Elk Herd. As I recall, the Bonneys refer to this trail, but I don’t have their book right to hand at the moment to check it. I will say it is rather difficult to find the trail unless you’re from here and just know where it is. It is little used and there is a lot of deadfall. You can get horses through, however, if you’re patient. At least one local outfitter uses this trail to get into the Dunoir to avoid the Wolf Creek or Bonneville Pass trailheads, which can be rather crowded because they’re popular access points. Unlike the West Dunoir, the East Dunoir is seldom visited, which is one reason I like to go there instead of into Dundee Meadows on the West Dunoir. Of course, the limestone canyon is in the East Dunoir. One you’re in the Dunoir, you have easy access to the lower portions above the private land of the Diamond G Ranch. The boundaries are pretty well marked. The aspens in the lower Dunoir are spectacular. Ralph–Thanks the Bonneville Pass photos. They bring out what is best about the Dunoir and all of the Absarokas. They are not “spectacular” in the conventional way, as are the granitic Winds, but they are superb wildlife habitat. As you said earlier, there is a sense of mystery you find in this country, which I dont find in the Winds. Robert, great pics! Is the Dunoir in the southern Absarokas or the northern Absarokas near Chief Jospeh highway? When I was in Yellowstone this year, I went down to Grand Teton for a few days and I was in awe at how fantastic the wildlife habitat was on the eastern side of the park there where it meets the Bridger Teton national forest. It seemed to be endless meadows and woods with rolling hills with far less granite as you say. Moose were everywhere. Is this Dunoir in the same area? I will answer because they are not Robert’s photos. It sounds like you were in the Teton Wilderness, which is tremendous wildlife habitat. The mountains there are lower and made of sedimentary rocks. I’ve never viewed one place that is a favorite over another. So much depends on the day, the clarity of the air, the clouds, the time of year. And wilderness? That too is ever-shifting. There are the Named, Designated Wilderness Areas on maps and then there are the wild places that are not wilderness areas, are not roadless, are not WSAs, but are really Out There, in the middle of nowhere, and very beautiful. And where if one wanted, one could disappear for weeks at a time and encounter no one. I think KT makes an important point. I have growing appreciation of remote places that are not necessarily without all roads. We ought not give up on a place if it gets roaded because this is becoming a deliberate tactic by some county commissions in places like SE Utah. I spend alot of time camping in the roaded drive-in campgrounds in our national forests. I think Ralph and KT make great points. Making sure the national forests *stay* national forests is the highest priority of all. I enjoy the wilderness and roadless areas, but I also really enjoy the roaded portions of our national forest and parks. One thing that frightens me is all the talk about “outsourcing” control of our national forest campgrounds. This past year, I had a run in with a private contractor who was assigned to run a campground in the Gallatin national forest just outside Yellowstone. Not a pleasant experience. I can see more remote campgrounds getting the axe, while the ones left to operate are “upgraded” with full RV hookups, satellite cable, snack machines and so forth. In response to Ralph’s questiona and this thread. there head near Younts and Thorofare Peaks …..
all the way to the Wind River Indian Reservation. snow. Great thread with lots of good remarks. Thanks Kayla. I don’t think there is a person alive who knows the Teton and Washakie like you do. Do you know an e-mail address for Kayla Michael? I am a distant cousin of hers and would like to contact her concerning some genealogy work that she has done on our family, as well as to hear her stories of living in Yellowstone. Thanks so much. Jean Hill Fry, Kayla is a good friend of mine. Ask Ralph to put us in contact and I’ll give your contact info to Kayla.